From time to time, there are things that seem to impress most people that do not impress me. I will spare you by not linking to my post about The Dark Knight for the zillionth time; if you don’t know my opinion, you’re obviously new to this blog. (Welcome!) Most recently, in commenting about Michael Fassbender’s work so far, I stated that I don’t like Tarantino, which got some reaction. It was suggested I write about that, and I probably will, at some point. Given that this post claims to be a review of Hitchcock’s Rear Window, I’m going to assume you can all figure out where I’m going with this, and I hope you’ll hear me out. Rear Window is #42 on the AFI list. It’s directed by Alfred Hitchcock, and tells the story of laid-up photographer Jeff (Jimmy Stewart) who has nothing better to do than look out of his window and watch his neighbors. When one neighbor begins acting suspiciously, Jeff becomes obsessed with figuring out whether or not the man has murdered his wife. He is encouraged in his investigation by his fiancee, Lisa (Grace Kelly), and his caretaker, Stella (Thelma Ritter). He is dissuaded by his friend, NYPD detective Tom Doyle (Wendell Corey). Naturally, given that it’s Hitchcock, the movie is suspenseful and keeps the audience guessing right up until the very end. Did I say it was “suspenseful”? Maybe for somebody. It’s obviously a very popular and highly-regarded film, and I can think of half a dozen people who are likely to pop up and tell me how insane I am for not liking it. I don’t think anyone’s mental health can be attached to their like or dislike of a movie, but I guess, in this case, I just didn’t get it. I didn’t find it to be particularly suspenseful, I didn’t find the characters to be engaging or enjoyable to spend time with, and I thought the entire device of the movie – the discussion between whether or not a crime had been committed or not – was ultimately completely confusing. Without giving anything away, I think what I’d have to say is that one of the voices, for me, was simply more persuasive than the others, and that when the big reveal was made, it did not happen clearly enough (and offered no explanation for points made elsewhere in the film) to give me any sense of closure. Wikipedia’s analysis of the film does pinpoint some other facets of the film that I can agree with. It is interesting as a look at relationships and how people interpret the events of others’ lives based on what’s happening in their own world. It’s very tightly constructed, and the actors all give a sense of being inhibited because they realize that if they can see what everyone else is doing, then everyone else must also be looking at them. I understand that the issues facing Jeff and Lisa in their relationship are mirrored by aspects of what they see in the neighbors’ relationships, and I think that Stewart and Kelly did a good job portraying two people who love each other but are uneasy about their differences. I get all of that. Mostly, I’m disappointed in the “suspense” label, and in how the main storyline is treated. I am generally a big chicken when it comes to creepy or suspenseful movies, and if a film never manages to make me jump once, it just doesn’t count in my book. As for the plot, I thought it was choppy, had some silly discrepancies, and didn’t fit together well once all the pieces were in place. Obviously, no director or genre is for everyone. I’ve seen four Hitchcock movies at this point, and three of them I found totally unimpressive. The fourth, North by Northwest, however, is freaking amazing, so maybe that one just hits all the right notes for me personally. I’ll be re-watching it again soon (it’s AFI #40), so I’ll try to compare it to what disappointed me about Vertigo and Rear Window. So now, here’s your chance. Explain to me whatever it is I seem to be missing. Please don’t tell me how stupid/insane/obviously-not-a-movie-person I am, as that isn’t really constructive. I would truly like to know what it is that makes Rear Window a big deal for others. It just wasn’t one for me. Now, we all know that I love musicals. More particularly, I love the MGM musicals; we’re talking classics like Singin’ in the Rain, American in Paris, Meet Me in St. Louis, and Seven Brides for Seven Brothers. As with any genre, though, the range of quality runs from excellent to poor, and usually the bulk of the examples falls somewhere in the middle. We’ve recently watched a couple of movie musicals that certainly fit into that mid-range category. As far as I can tell, both of these were moderately successful, and they’re not unenjoyable. They’re just lacking something indefinable that the really great musicals have. It’s hard to say exactly what that is – it’s not necessarily star power – but I think if you’ve seen them, you’ll probably agree. On paper, this Wild West romp looks like a winner: it stars Doris Day and Howard Keel, and is the story of a rough-and-tumble frontierswoman who learns to embrace her feminine side and find love. It is certainly entertaining, but it’s weak in various areas. The songs, by Sammy Fain with lyrics by Paul Francis Webster, are not very memorable, and lack a certain cohesion of style; the reason for which I’ll get to in a moment. The story is straightforward enough, but it could have been a little bit more developed, as could the characters. The biggest problem, for my money, is in the casting of the title role. Doris Day was in the midst of a very successful career when she made Calamity Jane, but I think the fit was all wrong. Day had a pop singer style which didn’t match well with the more operatic singing of her co-star, Howard Keel. Additionally, those songs obviously written to accommodate Day’s style don’t fit with the rest of the score. Mostly, though, she just doesn’t seem comfortable or natural in the role. Sure, it’s a musical, but there’s still a level at which over-the-top acting can go too far, particularly when compared with the rest of the cast. Howard Keel was a verified musical star whose machismo and brawn were well-suited to Wild Bill Hickock, while Allyn Ann McLerie and Philip Carey were spot-on, if a touch underutilized. 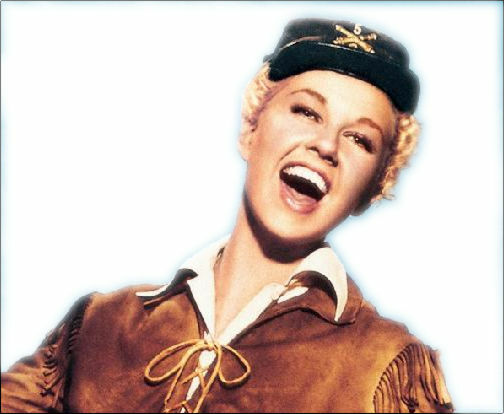 I can appreciate that the character of “Calamity Jane” is naturally larger-than-life and must carry the show, in some ways, but I think Doris Day did so clumsily and with a lot of obvious hard work. I spent most of the movie wishing that either Lucille Ball or Ann Miller had been available to take on the part instead. Calamity Jane was created in answer to (better-known?) Annie Get Your Gun, which also starred Howard Keel, and one can’t help but assume that the latter is the superior movie. I’ll get around to watching it one of these days, and I’ll let you know. How to Succeed … is currently enjoying a revival on Broadway. Though the film version looks a little dated, the story is still relevant in today’s corporate culture. J. Pierpont Finch is a window washer with big dreams. Aided by a book (see musical’s title) that gives him step-by-step instructions, he makes his way through the ranks of the Worldwide Wicket Corporation in record time, but he has to stay one rung ahead of the game to come out on top. It’s a tongue-in-cheek look at the world of big business that also manages to have a heart. In the film version, our hero is played by Robert Morse (now of Mad Men fame), who embodies the role perfectly: he’s got a touch of innocence, a touch of earnestness, and a touch of mischief. He’s also a little twitchy and odd, which seems to fit, somehow. His supporting cast are all fine, most notably Anthony Teague as rival Bud Frump. The music itself is pretty forgettable, as there’s more emphasis on the lyrics and the story in this particular case. The choreography by Dale Moreda, which is “based on” that of Bob Fosse, is pretty good; Fosse’s crisp, sleek, and modern style lends itself to an office environment somehow. How to Succeed … suffers a little bit from the same problem as Calamity Jane in that the lead actor is just a little off-putting and over-the-top. Again, it’s necessary, but some people manage it better than others, as I’m sure we’re all aware. In this case, there’s not really a strong presence like Keel’s to balance out the main character, as this show is nearly all about Finch (F-I-N-C-H) with only the slightest development of any other characters, including love interest Rosemary Pilkington (Michele Lee). Overall, I think How to Succeed … is a little bit of an oddity. If you’re into musicals in general, you should probably check it out, but it’s not making any waves or “greatest musicals” lists. Again, entertaining, but just lacking that special something. In watching these movies, the husband and I went to take a look at the AFI’s Great Movie Musicals list, and it’s a pretty excellent collection of movies. We’ve actually seen about three-quarters of them already, so maybe we’ll work on rounding the list out. New viewing project, just what we need! Have you seen either of these musicals? What’s your opinion? Do you think they stack up with the greats? It’s time. You knew it was coming, didn’t you? You probably knew before I did, because to be honest with you, I resisted for a while. It didn’t matter that I was regularly watching interviews and clips from late-night talk shows, or that I actually had dreams about the guy (I’m a PG-rated dreamer, shut up). I just wasn’t ready for a shake-up. Am I playing this up too much? Maybe so. Let’s backtrack. I’ve been somewhat bored and disappointed with my Top Five lately. Robert Downey, Jr. seems to only be in it for the paycheck these days, Gerard Butler keeps on making crappy rom-coms, Russell Crowe hasn’t had a new movie out in nearly two years. A word about Russell Crowe, though: in case you missed it, I am super-super excited about Les Miserables, and, if you haven’t checked out his IMDb page recently, I recommend doing so for some recent pictures that ought to definitely shut up the people who like to call him fat. RDJ is not the only one who can rock a three-piece suit, yo. So, Mr. Crowe is not going anywhere. Despite that, I have actually entertained notions of a complete overhaul, except that as usual, I can only come up with four (newer) actors who currently keep me interested, and really, only two of those are viable. And one of those, well, he’s now official. Yep. 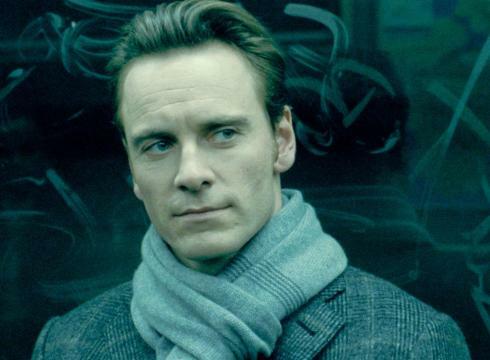 Sorry about that Oscar nomination, Michael Fassbender, but hey! You’ve made my Top Five! That’s totally prestigious and important. I guess I’m a little bit of a bandwagon-joiner, since I can’t claim to have seen Fishtank or Hunger, or even Inglorious Basterds (I don’t do Tarantino). But, I will say that I remember Fassbender from trailers for 300. He’s the one who, when told that “[the Persians’] arrows will block out the sun” replies “Then we will fight in the shade.” Yeah. I remember that. “Who’s that?” I thought. “He’s kinda hot.” I remembered it later when he was cast as Rochester in Jane Eyre, and when he was announced as Magneto, but I didn’t think much of it. The buzz started to get louder, but I mostly ignored it, as you do with buzz. And then, my friends, then I saw X-Men: First Class. I could not keep my eyes off the guy; not because he looked particularly great in a turtleneck (nobody looks good in a turtleneck) but because he was just that freaking good. I watched Jane Eyre as soon as it came out on DVD, and again, he was fantastic. The boy can seriously act. Good acting is requisite for The List. Yes, he also needs to be attractive, and he’s got that covered. His features can be a little cruel, I think, but if you’ve watched any interview with him, you know that he probably spends at least a third of it laughing. His laugh is charming. He laughs with abandon; throws his head back and really lets it go. His smile is also delightful if a bit toothy. Seriously, Fassbender’s got a lot of teeth. Finally, he seems very bright, and he will apparently start singing at the drop of a hat. It’s the singing that did me in, to be honest. He’s been quoted as saying he’d love to do a musical. Hollywood, GET ON THAT. The last thing that I will say is that from certain angles, he has a really impressive resemblance to Christopher Plummer circa The Sound of Music. Yep. Take a look at that picture up there for a minute. He is totally Captain Von Trapp-alicious. Once you see it, you can never go back. Forgive me some literary geekiness for a moment, won’t you? Today is the 200th anniversary of the birth of Charles Dickens, arguably the greatest English-language novelist in history. I’m a big fan. As such, I thought I’d post a Musical Moment in tribute. Obviously, this comes from the 1968 musical Oliver!, which is an adaptation of Oliver Twist. Have you read it? You should. It’s my pick for the best Dickens novel to get started with. At any rate, this is my favorite song from that show, so enjoy! We’ve been watching movies pretty regularly on the weekends again, and I’ve gotten behind! I sort of wanted to write a full review of a couple of these, but brief seemed the way to go. 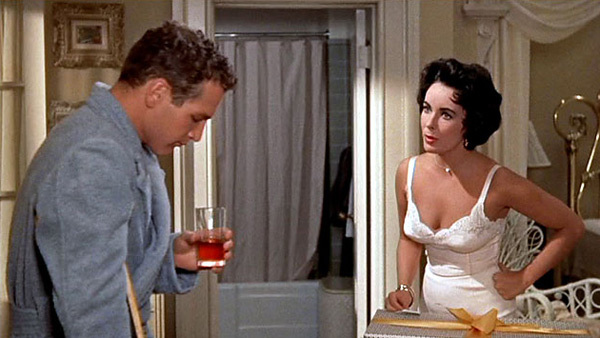 Much like any play-turned-film, Cat on a Hot Tin Roof is a towering monument of serious Acting. From the very first line to the very last, it just doesn’t let up, and the result is awesome. Tennessee Williams’ story of the dysfunctional Pollitt family actually translates pretty well to the screen, and is more creatively staged than a lot of similar projects. Elizabeth Taylor and Paul Newman remind us all that they are definitely more than just pretty faces (and boy, what faces), and I had no idea that Burl Ives was a serious actor, but he is absolutely phenomenal as Big Daddy. I promised my husband that this would be better than A Streetcar Named Desire, and it definitely delivered. Fans of the stage play may be a little put off by a certain amount of “Hollywoodization” (less ambiguity, slightly happier ending), but this is still a classic worth watching. If nothing else, you can just sit there and marvel at the absolute gorgeousness of Taylor and Newman. They are at the top of their game here. Oh, Robert Altman. Sometimes you’re just so weird. The extremely meta nature of The Player seems to me to indicate vintage Altman. Tim Robbins plays a Hollywood executive who’s being stalked by a disgruntled writer whose story idea he rejected. Suddenly, he finds himself in the midst of a murder investigation, some power struggles and turnovers within his company, and a budding romance with the murder victim’s girlfriend. Hilarity ensues? There are definitely plenty of laugh-out-loud moments, but most of the laughter is of the “no wait, seriously?” variety. The fun part is that everyone is in this movie. Half of them are “playing themselves,” since this is a satiric look at the industry, but that’s ok. The late 80s/early 90s fashions are also fun to look at. I didn’t love the sub-plot involving Whoopie Goldberg and Lyle Lovett (it tried to be funny and was mostly just bizarre), but beyond that, this is a pretty solid, if weird, movie. This “rom-com for grown-ups” boasts a really strong cast, and a mostly enjoyable (if rather unrealistic at points) storyline. Cal (Steve Carell)’s wife Emily (Julianne Moore) admits to an affair and asks him for a divorce, and so he turns into a sad-sack haunting the local bar until ladies’ man Jacob (Ryan Gosling) decides to teach him how to get his manhood back. In the meantime, Cal’s son Robbie (Jonah Bobo) is in love with the baby sitter (Analeigh Tipton) who’s got her own crush, and Jacob himself is intrigued by the fiery redhead (Emma Stone, natch) who doesn’t fall for his lines. All of these different strands get tangled together in some interesting and mostly hilarious ways, and maybe the best thing about the movie is that it doesn’t neatly tie them all off at the end. Life and love are uncertain, and Crazy, Stupid, Love keeps that in mind. Julianne Moore and Emma Stone spot-on here, as always, and Steve Carell generally manages to be charming when he’s not trying so hard to be “funny.” Ryan Gosling and Jonah Bobo are both excellent; probably the best characters in the movie, in my opinion. Great supporting turns by Kevin Bacon as Cal’s competition and Marisa Tomei as a slightly crazy lady he takes home from the bar really add to the solid acting chops of the whole ensemble. The story gets a little bogged down toward the end, but is ultimately redeemed by the fact that all of the characters are fleshed-out individuals that you feel sympathetic toward, so in the end, it’s a really fun movie. Up next: Rear Window and Calamity Jane. My mind is slightly boggled by the combination of Doris Day and Howard Keel. What’ve you been watching?